Book Adventure Course Now! Book Adventure Zip Lines Now! Spend the weekend immersed in the beauty of the Flagstaff terrain, while enjoying pushing yourself beyond what you thought you were capable of. There is nothing like playing with friends and family up in the trees. Enjoy the challenge, feel the sweat, and push boundaries. Forge new ground on the course, and in the relationships that matter most to you. Hours of tree-to-tree adventure on our Adventure Course! Height requirement: While keeping feet flat on the ground and arms raised above your head, palm of hand must be able to touch the height of 5’11″. Ages 12-15 must have a waiver completed by their parent or legal guardian and be accompanied by an adult in the ratio of 3 children to one adult. Ages 16-17 must have a waiver completed by their parent or legal guardian but may participate without an adult upon the course with them. Includes the Kid’s Course only. Height requirement: While keeping feet flat on the ground and arms raised above your head, fingertips must be able to touch the height of 4’7″. All minors must have a waiver completed by their parent or legal guardian. The Adult may not leave the child without supervision. Please call to book a guide in advance. For minors who qualify to participate on and do not have an adult to climb with them, please ask our staff about the Private guide service. Experience the greatest adventure with a professional Flagstaff Extreme Guide. *Note: If our Guides or Staff determine a child participating should not continue due to difficulty or any other reason, child must come down from the course which he or she is participating on. Flagstaff Extreme operates RAIN/SNOW or SHINE. Only severe weather conditions such as lightning in close (6 miles) proximity, high winds (over 40 mph), fire conditions, extreme cold and/or possibly heavy rain/snow will temporarily close the courses. In the event that we close the Park and guests have been waiting for over an hour, guests can receive a RAIN CHECK* or REFUND provided they have completed only two or less of the Courses. Customers that have progressed through 2 Courses and are on the 3rd Course or further will be issued a RAIN CHECK* *RAIN CHECKS are valid for 60 days from issue or the current season year whichever is sooner. Additionally, during the months of December, January and February, when we operate we will do so when the temperature is above 25 degrees. You may reschedule (if the temperature is below our threshold) to a future date in our Winter Season, but we do not offer any refunds. We’re a bunch of thrill-seekers who believe in breaking boundaries and building relationships in challenging environments. 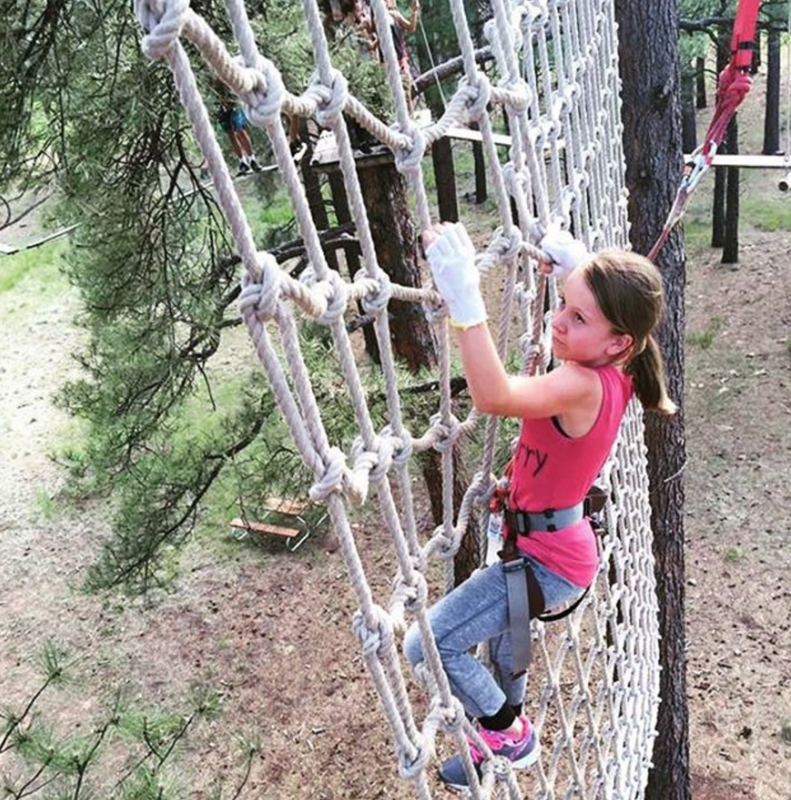 Our Tree Top Adventure course is an elevated obstacle course set in the tall Ponderosa Pines and securely suspended between the trees at 15 to 60 feet off the ground. Some of the features of course include suspended bridges, swings, slides, nets, ziplines and even an aerial surf board. With more than 30 exhilarating zip lines you’ll be sure to find something to satisfy your adrenaline needs. Book now to be one of the first visitors at the largest zip line course in the western United States. 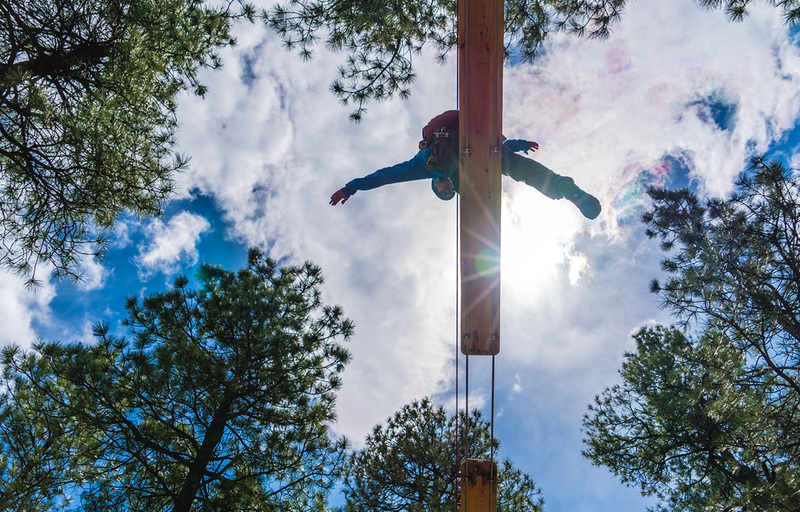 Our Adventure Zip Lines are suspended 15 to 80 feet in the tall Ponderosa Pines. The experience is self-guided: each guest will receive training to prepare themselves for a day of adventure. Bring your friends, family, or coworkers for an exciting expedition in the trees traversing over 40 elements!